The Flu Vaccine - Are We Being Fooled? There is an ongoing scandal about whether the flu vaccine is beneficial for any age group. Flu symptoms have a multitude of causes. Only 1 to 3% of adults have a type of flu each year that is targeted by flu vaccines. High values of claimed effectiveness mislead anyone not familiar with incidence statistics. Expert reviews of the flu vaccine agree that the vaccine has very little if any benefit. Conclusion: If all the available data from flu vaccine trials is included in effectiveness (efficacy) calculations, flu vaccines show NO effectiveness. The statements above are addressed using common knowledge and frequently quoted statistics on yearly flu incidence, followed by an experts review of flu vaccine trials and, finally, trial data from one flu vaccine manufacturer so you may judge for yourself. For the sake of brevity, our study is confined to data from one manufacturer and one age group, adults 18-64. Younger and older age groups experience higher incidence numbers but the same principles and conclusions discussed here apply. The presented data is typical of industry wide methodology and results. What can cause flu symptoms? Typical flu symptoms are fever, chills, muscles aches, weakness, headache, dry cough and sore throat. Fever is the body's immune response to an infection or accumulated toxins. Muscle aches and weakness are the result of toxins moving in the blood stream. Cough and sore throat are associated with a higher than normal body toxin level and constipation. A wide variety of toxins can trigger detoxifying symptoms similar to those associated with the flu. A short list includes food poisoning, pesticides, herbicides, herpes and STDs, some insect and spider bites, chemotherapeutic agents, carbon monoxide, formaldehyde and influenza vaccines. When specimens from patients with flu symptoms are lab tested to determine the cause of their illness the resulting “chemical signature” usually characterizes an influenza-like illness (ILI). These ILIs have all the symptoms that both laymen and professionals identify as the “flu.” However, only a small percentage of ILIs are true influenza as defined by medical professionals. These defined “chemical signatures” are referred to as clinically-confirmed or culture-confirmed influenza to distinguish them from other ILIs. Each year's flu vaccine targets three of the many types of culture-confirmed influenza and thus is recognized as ineffective for all other types. 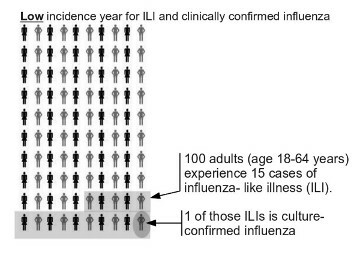 How many cases of influenza occur each year in adults aged 18-64 in the USA? Annual ILI incidence is between 15 to 20 percent of the adult population. In a year when both ILI and true influenza have high incidence, about 3% of the population have what medical professionals call culture-confirmed influenza. In a low incidence year, this number drops to 1%. Since 97 to 99 adults out of 100 escape culture-confirmed influenza each year without vaccination, it defies logic to think a vaccine will actually improve natural immunity and reduce the chance of getting the flu. The graph to the right illustrates the same principle as above, except that here is pictured a low incidence year when only 1 person out of 100 adults experiences a culture-confirmed case of influenza, the sole target of the vaccine. We frequently hear the claim that “the flu vaccine reduces the odds of getting the flu by 70% to 90%.” However, this claim is based on the appearance of a reduction of between 1 to 3 cases of influenza for each 100 adults. Example: The standard formula for effectiveness yields 67 percent effectiveness when one reduces the number of cases by two out of three. 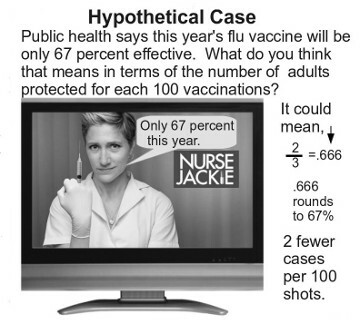 When you hear 70% to 90% do you think the speaker means a reduction of less than 3 cases per 100 vaccine recipients? Expert review warns trial conclusions are often manipulated. After reviewing available flu vaccine trials, the Cochrane Collaboration concluded, “Influenza vaccines have a modest effect in reducing influenza symptoms and working days lost. There is no evidence that they affect complications, such as pneumonia, or transmission.”(1) The review warns “... reliable evidence on influenza vaccines is thin but there is evidence of widespread manipulation of conclusions and spurious notoriety of the studies. The content and conclusions of this review should be interpreted in light of this finding.”(2) [Bolded for emphasis.] In effect, this professional, industry-independent organization concludes that currently even the best available trial conclusions may be erroneous. We will show that incomplete data is the reason why industry conclusions for flu vaccine effectiveness are incorrect. Vaccine trial conclusions are based on incomplete data. The graphic below illustrates the need for complete data to determine if a vaccine is beneficial or not. It is common in influenza vaccine trials to ignore the disease symptoms occurring in the two weeks following vaccination. The zero ILI occurring in the non-vaccinated during the 2 weeks following the start of the vaccination trial is based on the trial beginning before an active flu season. During an off season month, about 1 patient in 200 that walks into a doctors office has the symptoms of an ILI. That's 1 in 200 patients, not 1 in 200 of the general public who constitute the 1000 non-vaccinated control group. 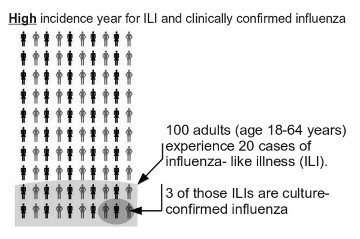 During the example (above) 7 month monitoring period, 150 ILI occur in the vaccinated versus 170 ILI in the non-vaccinated a difference of 20 or 12%. The difference between 32 culture-confirmed influenza cases in the non-vaccinated and 12 culture-confirmed influenza cases (62.5% less) in the vaccinated is even more dramatic and will form the basis for advertised effectiveness. However, note 50 ILI that occurred in the vaccinated in the two weeks following vaccination were ignored when calculating effectiveness. 150 plus 50 is 200 total ILI in the vaccinated versus only 170 in the non-vaccinated for the whole season. Vaccine package inserts are one source of vaccine trial data. Package inserts, also known as prescribing information (PI), are published by each vaccine's manufacturer. Table 4 (below) and Table 1 (below) are from the PI for Fluarix, a GlaxoSmithKline flu vaccine, copyright 2012. (3) In Table 4, (below) under “Attack Rates” for “All Culture-Confirmed Influenza (Matched, Unmatched, and Untyped)” we see a 1.2% influenza attack rate for Fluarix recipients and a 3.2% attack rate for placebo recipients. This claim means two fewer flu cases per 100 vaccinated adults. A typical flu lasts 7 days, therefore 14 fewer days of flu symptoms are alleged to be suffered by each 100 Fluarix recipients compared to 100 placebo recipients. This alleged benefit will be true only if all adverse events were recorded and included in the calculation of benefit. Ignored data is examined next. Do vaccine recipients suffer less than non-vaccinated? According to the PI, test participants were “... monitored for influenza-like illnesses (ILI) starting 2 weeks post-vaccination and lasting for approximately 7 months.”(4) Table 1 (below) lists Solicited Local Adverse reactions. Fluarix recipients had 11% higher rates of muscle aches than did placebo recipients in just four days following vaccination. Hmm, muscle aches, could that be the flu? Excess adverse events in vaccine recipients versus placebo recipients must be subtracted from the alleged benefits list in Table 4. The 11% muscle aches occur a minimum of 11 days and reduce the alleged 14-day benefit of the flu vaccine to 3 days. Five of the 7 unsolicited adverse events listed above - Nasopharyngitis, nasal congestion, diarrhea, vomiting and dysmenorrhea total 9% versus the placebo 4.7% (9 - 4.7 = 4.3), an excess of 4.3%. This is a minimum of 4 more days of misery equal in intensity to flu symptoms to be subtracted from the remaining 1 day of alleged vaccine benefit. “Benefit” total (3 - 4 = -1) is now less than zero showing that the vaccine is harmful rather than beneficial. There are two remaining adverse reactions. 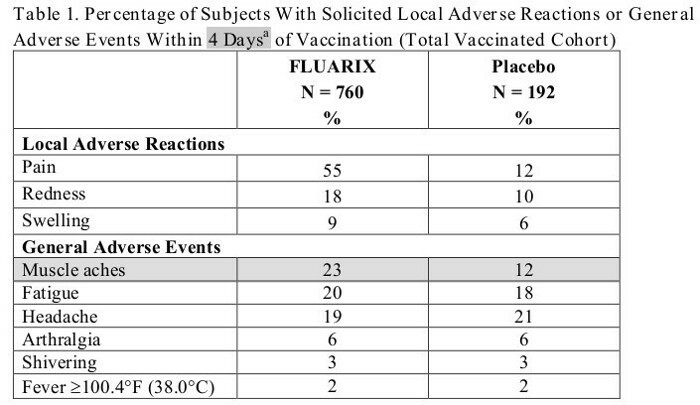 Upper respiratory tract infection was 1.3% greater in the Fluarix vaccinated versus placebo. Likewise, influenza-like illness was 1.1% greater in the vaccinated versus placebo. These two adverse events are similar to clinically-confirmed influenza that averages 7 days in duration. The excess of 2.4% (1.2 + 1.3 = 2.4) is bigger than the claimed 2% “benefit” in Table 1 of the PI. We cannot subtract the full 2.4% because these “unsolicited adverse events” occurred 0-21 days following vaccination. A portion of the ILIs extending beyond 14 days may have been included in the 7 month monitoring period. Adding the adverse events in the 2 weeks following vaccination to the diseases occurring in the following 7 months shows more disease occurred in the vaccinated versus the non-vaccinated. Even this limited trial data shows the vaccine less than worthless in the first flu season following vaccination. Apparently some cases of flu that would have occurred in the 7 month flu season have simply been “shifted” to the period immediately following vaccination and NO prevention of disease has occurred but rather the opposite, disease increased for those who accepted Fluarix. Other brands of flu vaccines show similar patterns. It is known that receiving a flu vaccination in one year makes one more susceptible to a severe flu the second flu season. Additional long-term consequences of injecting viruses and various chemicals including formaldehyde contained in flu vaccines are unknown due to the absence of scientific research. Aluminum and mercury that are in some influenza vaccines have been associated with increased risk of Alzheimer disease. A search of the Vaccine Adverse Event Reporting System (VAERS) data base for influenza vaccine (all manufacturers, all ages of patients, covering 1990 to current date, 21 March 2013) reveals 918 events where Vaccine is influenza and patient died, 1799 events were life threatening, 24,339 events resulted in ER visit and 6737 events where patient was hospitalized. Less than 10% of adverse reactions are reported to VAERS.